I typed Starbucks into eBay and this is what I got. 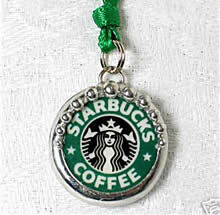 The PERFECT addition to any Starbucks coffee lover’s charm bracelet! This sweet circle charm has been lovingly hand crafted using a piece of Starbucks broken china, which has been encased in a silver alloy bezel. The charm measures approximately 3/4″ round, and would make a unique gift for anyone – including you!